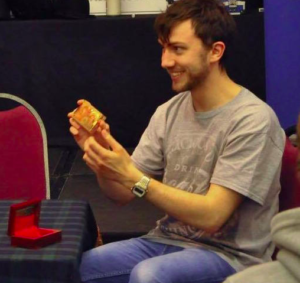 Andrew has been a member of the Forth Valley Magic Circle since May 2016, and specialises in close-up magic. Andrew’s interest in magic started at a very young age when he was regularly entertained by a friend’s magician father whose house he often visited after school. During his school years Andrew went on to become a member of The Young Magicians Club (the youth initiative of The Magic Circle), and eventually joined the Forth Valley Magic Circle whilst he was a student at the University of Stirling. Andrew’s favourite magicians are David Copperfield, Shin Lim and Dynamo. Outside of magic, Andrew currently works in financial services, and is also a very passionate tennis fan.